A locally produced documentary and a Hampton High School presentation of a well-known play on human rights are the highlights of events planned in Fredericton to mark the International Day for the Elimination of Discrimination, which is this Thursday, March 21. Semra Yüksel’s compelling new documentary It was the Dance addresses racism, socio-economic injustice, history and world politics through the true stories of an Austrian Jewish refugee and an African-Canadian soldier with Black Loyalist and Maliseet ancestors who fell in love in London during World War 2 and settled down in New Brunswick after the war. This screening of the 45-minute documentary is sponsored by the New Brunswick Human Rights Commission, the Atlantic Human Rights Centre (AHRC) and UNB’s Office of Human Rights and Positive Environment. The It was the Dance documentary will be shown at 7:15 p.m. on Thursday, March 21, in Room 101 of Brian Mulroney Hall at St Thomas University in Fredericton. Admission is free. Pulitzer Prize winner Ariel Dorfman`s powerful and haunting play, Speak Truth to Power, Voices from Beyond the Dark, was inspired by the accounts of 50 heroic human rights activists chronicling horrific human rights abuses around the world. A presentation of the Hampton High School Theatre Company, the play is directed by Shane MacMillan, designed by George Fry and produced by Beth Pollock. It is sponsored by the Human Rights Commission, the AHRC, UNB’s Office of Human Rights and Positive Environment and the Hampton John Peters Humphrey Foundation. 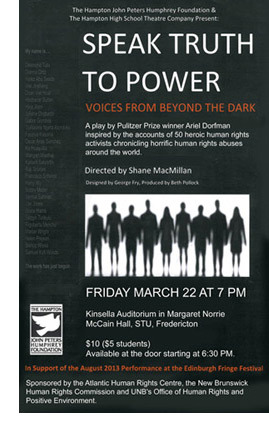 The Speak Truth to Power play will be presented at 7 p.m. Friday, March 22 in the Kinsella Auditorium of the Margaret Norrie McCain Hall at St. Thomas University in Fredericton. Tickets are $10 ($5 for students) and available at the door starting at 6:30 p.m. on March 22. Money raised through ticket sales will go towards a showing of the play in Edinburgh this summer to compete in a theatre competition. The play deals with mature subject matter. The directors of the play and documentary are available for media interviews. Francis Young, human rights officer, New Brunswick Human Rights Commission, 1-888-471-2233. Shane MacMillan, director of Speak Truth to Power, 1-506-832-6123.